William Hill is a world leading betting and gaming company with both an online sportsbook and an online casino section, operating out of the United Kingdom since 1934. While William Hill is well known globally as a sports and racing betting site, its online casino section is not one to be ignored, with over a hundred high-quality real money casino games from premium software studios like Playtech on offer. William Hill is licensed and regulated by the UK Gambling Commission (for Great Britain players) and the Gibraltar Gambling Commissioner (for all other international players), meaning it is a safe and easy gambling recommendation. William Hill is a world renowned online betting site first and foremost, so it’s only natural we point our readers their extensive range of betting markets, including baseball, basketball, boxing, cycling, esports, golf, ice hockey, motorsports, rugby, UFC, winter sports and greyhound and horse racing. If you’re an online casino player who also loves placing a bet on your favourite sports or racing markets, we highly recommend checking out William Hill as a potential two-for-one gambling destination – and reading our in-depth William Hill sportsbook review for more information. William Hill accepts anyone from Australia, Germany, Italy, Macau, Latvia, Spain and Ukraine who want to open up an account, but due to specific gambling laws in those regions, they have limited access to certain services. Australia, Italy and Spain: These must sign up at the William Hill sites based in the region and can only use the sportsbook side of the site, so this review of William Hill’s online casino section is unfortunately redundant. Visit our online casinos guide for our top casino site recommendations for your country. Germany: German players can sign up at William Hill and play at both their instant-play and downloadable online casino, but cannot place bets on certain sports and racing betting markets. Latvia: Latvian players can sign up at William Hill and play at both their instant-play and downloadable online casino, but cannot access live dealer games offered by the site. Macau: Macau players can sign up at William Hill and play live dealer games, but cannot access any other part of the online casino or poker sections of the site. Macedonia: Macedonian players can sign up at William Hill and play at both their instant-play and downloadable online casino, but cannot access their online sportsbook. Ukraine: Ukrainian players can sign up at William Hill and play live dealer games, but cannot access or play any other part of the online casino or poker sections of the site. Residents of the following countries are currently not able to register for an account at William Hill: Afghanistan, Algeria, Bangladesh, Belgium, Benin, Botswana, Brazil, Bulgaria, Burkina Faso, Cambodia, Cameroon, Central African Republic, Chad, China, Congo, Cuba, Cyprus, Denmark, Djibouti, Equatorial Guinea, Estonia, Ethiopia, France, French Guiana, Gabon, Gambia, Germany, Greece, Greenland, Guadeloupe, Guinea, Guinea-Bissau, Haiti, Hong Kong, India, Indonesia, Iran, Iraq, Israel, Ivory Coast, Lesotho, Liberia, Libya, Mali, Martinique, Mauritania, Mongolia, Montserrat, Myanmar, Netherland Antilles, Netherlands, New Caledonia, Niger, Norfolk Island, North Korea, Norway, Philippines, Poland, Portugal, Reunion, Romania, Rwanda, Samoa, Sao Tome & Principe, Saudi Arabia, Singapore, Solomon Islands, Somalia, South Africa, Sudan, Surinam, Swaziland, Syria, Thailand, Togo, Tonga, Turkey, Uganda, United Arab Emirates, Uruguay, USA, Vanuatu and Yemen. William Hill has a comprehensive FAQ section which does a great job of answering many questions, including region-specific exclusions, so hop on there for further information. It’s up to the player to also be aware of and educated in current online gambling laws in your country prior to signing up for an account. William Hill Casino has regular promotions and rotating bonuses for all players to take advantage of, neatly listed in the ‘Promotions’ tab of both their instant-play casino and downloadable casino interface. 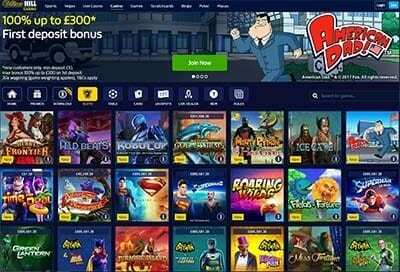 £300 sign-up bonus: William Hill Casino currently offer a 100% matched deposit bonus as part of their welcome package for new registrations. If you deposit anywhere from the minimum £10 up to £300 on your first deposit, your account is credited automatically and immediately with the matched bonus. Just log into your first game to see the bonus in your account balance, and you’re set. 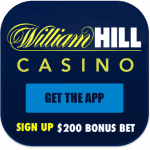 It was effortless and painless to get our bonus at William Hill, and overall we find it be a decent boost to our starting balance compared to other casino sites. Daily Buy-in Bonus: Buy in with £30 or more from your casino account balance during the specified promotion period and receive an additional £20 to play with. This one changes every few weeks but the general bonus conditions remain similar. 150% up to £200 Download Welcome Bonus: Valid to players who have already made their first deposit at William Hill Casino via the desktop instant-play website or on mobile. All you have to do is download the William Hill casino software and login to your real money account; from there, deposit £10 minimum and head to the promotion section to enter the amount you wish to contribute towards the bonus. You can redeem it instantly. All players at William Hill Casino can earn comp points with every bet made which can then be redeemed for rewards via their exclusive loyalty program. You get one point per every $10 wager, and every 100 comp points can be converted into €/£/$1 real money. It’s a standard-fare rewards program that doesn’t stand out from the pack in any particular way, but it’s definitely an appreciated scheme that allows long-time players to reap rewards with continued play. 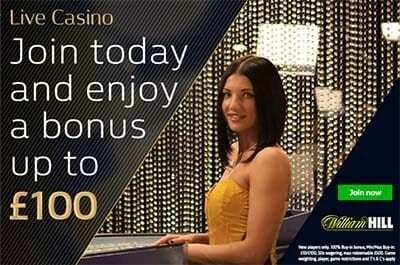 All bonuses at William Hill Casino are subject to a 30X wagering requirement, which means you have to deposit and bet a certain amount before you are allowed to withdraw any potential winnings earned from using your bonuses. You can check out the very detailed stake contributions for each game offered at William Hill in their FAQ and Terms and Conditions sections. Promotions generally change monthly, so check often to take advantage of rewards. 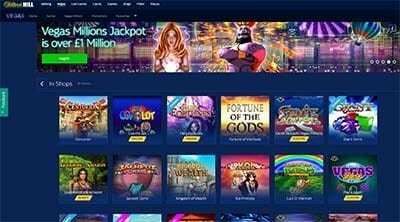 William Hill is one of the few modern-day casino sites to still offer a downloadable version of their online casino in addition to the standard instant-play, no-download casino played directly via your Web browser and powered by Flash and Java. The gaming experience is virtually the same between the versions, with the only major differences being slight interface changes and less games (around 70) offered within the downloadable William Hill Casino. It really comes down to personal preference, but the team at BettingPlanet recommend just playing the browser-based version due to ease of accessibility and more games choice. For their mobile casino, William Hill offer a downloadable app on Apple App Store and Google Play for Android which runs flawlessly, but mostly only hosts online slots and less games than the desktop version due to the porting costs and time associated with getting only the best games to mobile platforms first. If you want the more niche stuff, stick with the desktop version. The standard William Hill Casino offers over a hundred different real money casino games powered by Playtech, with the vast majority being online slots (classic, video, progressive jackpot and more). Table games on offer include baccarat, blackjack, craps, roulette and video poker. There are also several niche games and more country-specific titles, like bingo, keno, Mahjong, arcade games like bowling, darts and Hi/Lo, which will be appreciated by those who don’t see them often at other sites. All of their games are neatly categorised into five tab categories, with a fast search system available if you’re looking for a particular game. Slots: 119 real money slots titles, ranging from progressive jackpot to classic three-reel and five-reel video slots. Table: 33 table games with multiple variations of baccarat, craps, roulette and Sic Bo, and tons of niche games like bowling, darts, heads or tails and rock paper scissors. Card: 39 card games with multiple variations of blackjack and video poker, and many other popular favourites like Carribean Stud, Casino Hold’Em, Red Dog and scratch cards. Jackpot: 73 real money progressive jackpot online slots from the same pool as the slots category, just in their own special section for ease-of-access. New: The latest games on offer at William Hill for your convenience. One very neat feature at William Hill is there is a dedicated ‘Rules’ tab players can click on to access detailed explanations as to how each and every game presently hosted on the site is played, which is great for casino newbies or when you have a go of something different. All casino members at William Hill Casino can enjoy a 24/7 live gaming rooms, which have their own section on the site under ‘Live Casino’. Live dealer games involve real people handling casino equipment and bets, streamed to your computer screen via high-definition video and often featuring attractive male and female dealers. You can currently play live versions of baccarat, blackjack, casino hold’em and roulette at William Hill, which are hosted and streamed live from studios in Las Vegas, Nevada and London, UK. William Hill Casino has a range of casino payment options available so all players from all accepted countries can process deposits and withdrawals safely. Presently, William Hill is licensed and regulated by the United Kingdom Gambling Commission for all customers in Great Britain and the Gibraltar Betting & Gaming Association for all other customers around the world, both of which are well known and trusted advanced gaming jurisdictions. William Hill Casino and the rest of its services (Live Casino, Sports, Racing, Vegas) is very transparent when it comes to its legitimate standing as a licensed online gambling site, giving it a huge plus in our books. The company very clearly clarifies its current license status at the footer of every page along with its exact license number, which is something which should be expected of all online casinos but sadly still is something that isn’t seen everywhere. William Hill uses 128-bit Secure Socket Layer (SSL) digital encryption technology to ensure the privacy and protection of player financial and personal information. This is the same industry-wide security systems used at financial institutions and other sites across the Web, and is pretty much the standard we expect whenever we review and recommend any worthwhile online casinos. William Hill Casino is one of the most trustworthy online casino brands out there thanks to its licensing from both Gibraltar and the UK Gambling Commission along with its global reputation as a trusted online sportsbook operator in multiple countries. While its real money casino gaming catalogue is very good, it isn’t the best in terms of variety and there are other sites we recommend with much bigger catalogues and player bonuses. Still, we were surprised at the the options we had given many other sportsbooks which offer a casino section tend to be slim pickings, which shows William Hill is taking their other businesses very seriously. The live dealer section is one of the best on the Web and the mobile casino experience is smooth and without fuss. Overall, we highly recommend William Hill to players who already have accounts with the sportsbook or for players who like having casino, live dealer, poker, sports betting, racing services rolled into one handy online destination.